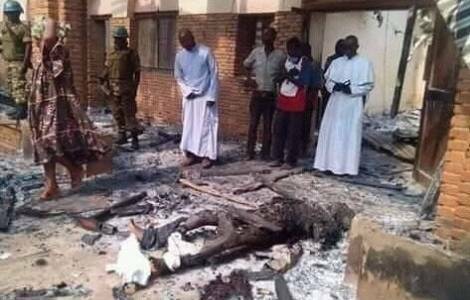 Bangui (Agenzia Fides)-“We ask for an international enquiry into the massacre in Alindao” said Cardinal Dieudonné Nzapalainga, archbishop Bangui, who went to the town in south-east of Central Africa where on 15 November ex Seleka rebels of the UPS (Unité pour la Paix en Centrafrique) under general Ali Darassa killed at least 60 persons most of them homeless people sheltering in a camp close to the cathedral (see Fides 17/11/2018). The camp was sacked and destroyed and there were two victims Vicar General, Mons. Blaise Mada, and rev. don Celestine Ngoumbango, parish priest in Mingala.